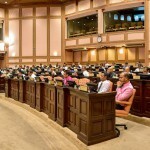 Key opposition MPs have expressed support for a ruling Progressive Party of Maldives (PPM) proposed constitutional amendment to authorise foreign ownership of land or freeholds in the Maldives. Some 62 MPs voted to consider the amendment and have sent it to a special committee for review. A three-quarters majority or 64 votes will be needed to amend the constitution. The ruling coalition only controls 48 seats in the 85-member house. With 62 MPs voting to consider the bill, it is likely to pass into law. The final vote is expected on Wednesday afternoon. 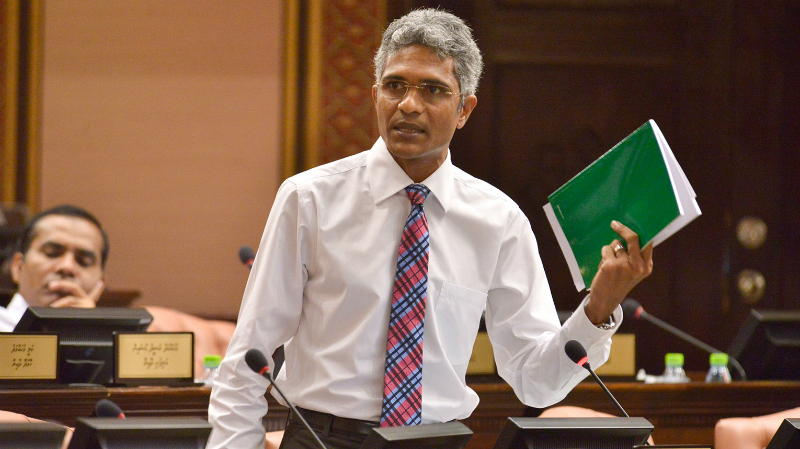 Speaking at tonight’s extraordinary sitting of parliament, MP Ibrahim Mohamed Solih, the parliamentary group leader of the main opposition Maldivian Democratic Party (MDP), expressed support for the amendment, but said the government must consider Indian Ocean security in awarding plots of land to foreign parties. The bill comes amidst increased attempts by the government to woo Chinese and Middle-eastern investors. The constitution currently prohibits foreign ownership of any part of Maldivian territory, but allows leasing of land for up to 99 years. The proposed amendments will allow foreigners who invest in a project worth more than US$1 billion to purchase land. At least 70 percent of the area when the project is completed must also be reclaimed land. Jumhooree Party (JP) leader Gasim Ibrahim said the amendment was needed in an interconnected world. Land ownership by foreigners on a freehold basis was allowed in developed countries, he added. Tonight’s sitting was scheduled after changes to the standing orders to fast-track the process of passing a bill into law was approved at this morning’s sitting. The legislative process includes three main stages and usually takes weeks or months. But under the new rules, a bill can be debated and passed into law on the same day. 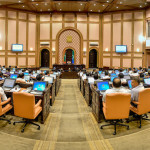 The amendment comes amidst negotiations between the government and the MDP. The opposition has so far backed several unprecedented measures proposed by the government in hope of freedom for jailed opposition leader Mohamed Nasheed and other politicians. The bill is the second amendment proposed to the constitution since it was ratified in 2008. MPs in June passed the first amendment to the constitution to set new age limits of 30-65 years for the presidency. Subsequently, vice president Dr Mohamed Jameel Ahmed was impeached today. PPM MP Ahmed Nihan – who submitted the amendments (Dhivehi) on behalf of the government today – said contrary to “misleading” media reports, the amendments would not allow the government to sell large islands or lose sovereignty over Maldivian territory. The PPM parliamentary group leader said the purpose of the amendment is to attract “extremely large” foreign investment and spur economic growth and infrastructure development. Nihan said Singapore developed despite the lack of natural resources because the small island state “opened up” to foreign investment. PPM MP Ali Arif emphatically stressed no land will be given for military purposes. The former ruling party MP suggested the JP and MDP had been coerced to support the amendment in exchange for freedom for Nasheed and a removal of a freeze on Gasim’s tourism companies. “They are worried about corruption. They want to divert funds wasted on corruption to development. They want tertiary hospitals,” he said. He said that the PPM wanted to award freeholds because it had failed to attract investment through the government’s flagship special economic zones (SEZ) legislation, which was passed in August last year. It gives investors tax breaks and relaxed laws. He further warned of unchecked corruption and undue influence of large corporations if the amendment passed due to weak oversight institutions and lack of accountability. Opposing the amendment, MDP MP Rozaina Adam said the government had failed to attract foreign investors because of a weak and politicized judiciary. MDP MP Fayyaz Ismail meanwhile said he supported the amendment in principle, but said extensive public consultations were necessary before he could back the bill. The opposition contended that the SEZ law would pave the way for money laundering and other criminal enterprises, undermine the decentralisation system, and authorise a board formed by the president to “openly sell off the country” without parliamentary oversight. But the government maintained that the law was necessary to attract large-scale foreign investments and to launch ‘mega projects,’ which President Yameen has said would “transform” the economy through diversification and mitigate the reliance on the tourism industry. 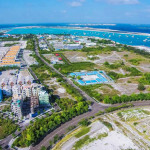 The mega projects include the construction of a bridge connecting Malé to Hulhumalé and the development of a ‘Youth City’ in the reclaimed artificial island. In January, President Yameen said 75 percent of the country’s population could be resettled in Hulhumalé and urged residents of islands with small populations to migrate to the new city. According to the 2014 census, the population of the Maldives stands at 341,256, of which 133,019 people resides in Malé. Other mega projects envisioned by the government includes the development of a transhipment port in the Maldives’ northernmost atoll. The Ihavandhippolhu Integrated Development Project (iHavan) also involves the development of an airport, offshore docking and bunkering facilities, an export processing zone, real estate businesses, and tourism facilities. In June, a group of Saudi Arabian investors reportedly visited Ihavandhippolhu. The Saudi Arabian government has also provided US$1 million as grant aid to finance the feasibility project. Additional reporting and writing by Zaheena Rasheed. The likelihood of a $1 billion investment in the Maldives is so small this is of so little consequence. The typical expensive resort in the Maldives costs $100million. So do we envisage somebody to come and build an investment to the tune of 10 resorts! This country is completely delusional. Foreign ownership of land is actually a very good thing. However, the SEZs currently envisaged for the Maldives is far too big for a country of our size. We need investment in the range of tens of millions rather than hundreds of millions or even billions. Foreign ownership of small villas on selected islands would have been more beneficial than this delusion of grandeur.